More than 300 men convicted by Saudi Arabia for taking part in terror plots have been jailed following trials criticized by a rights group for their lack of transparency. Saudi Arabia reported last week that 330 people had been convicted of membership in a “deviant group” — a reference to the al Qaeda terrorist network, founded by Saudi exile Osama bin Laden. On Monday, a Justice Ministry spokesman released more details about the group, saying that 323 will serve time in jail “varying from a few months to 30 years, with 13 of them sentenced to more than 20 years,” according to the official Saudi Press Agency (SPA). The other seven were acquitted, the spokesman Abdullah bin Hamad al-Saadan said. Most of the 330 are Saudi nationals, and al-Saadan said he knew of no women among the group, according to SPA. U.S.-based Human Rights Watch criticized the Saudi authorities for holding the trials behind closed doors and for denying defendants full access to lawyers. The 330 convicted men were “involved in the deviant group’s work, communication, coordination and working with external forces that are conspiring against the national security to spread chaos and disrupt security,” according to a court statement published by SPA last week. The plots included financing attacks within Saudi Arabia and defying King Abdullah’s order against joining Islamic insurgencies in countries like Iraq and Somalia, the statement said. Saudi authorities announced in October that they would put on trial nearly 1,000 people accused of having ties to al Qaeda, which supports the overthrow of the Saudi monarchy and carried out the 2001 suicide hijackings in the United States, the kingdom’s leading ally. 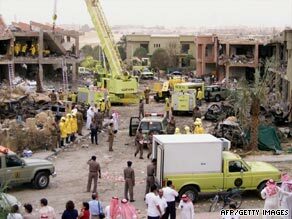 Al Qaeda launched a wave of attacks on government buildings, oil installations and international contractors in Saudi Arabia in 2003. Saudi authorities rounded up several thousand suspected militants in a crackdown that followed the attacks, with many of them being held for years without charges, according to Human Rights Watch. Sarah Whitson, the organization’s Middle East director, said the Saudi government broke an initial promise to allow outside observers into the trials. The defendants faced “very vague” charges with limited access to lawyers, Whitson said. “They (the Saudi government) have been completely closed, which is quite unfortunate, because the flawed nature of the trials would have been much more readily apparent,” she said.